This is the seventh time Pew Research Center has measured restrictions on religion around the globe.34 This report, which includes data for the year ending Dec. 31, 2014, generally follows the same methodology as previous reports. Pew Research Center uses two 10-point indexes – the Government Restrictions Index (GRI) and the Social Hostilities Index (SHI) – to rate 198 countries and self-governing territories on their levels of restrictions.35 This report analyzes changes in restrictions on an annual basis, focusing on the period from 2013 to 2014. Changes in overall levels of restrictions are calculated for each country by comparing its scores on both indexes (the GRI and the SHI) from year to year. When a country’s scores on the GRI and the SHI changed in the same direction (both increased or both decreased), the greater amount of change determined the category. For instance, if the country’s GRI score increased by 0.8 and its SHI score increased by 1.5, the country was put into the overall “1.0-1.9 increase” category. When a country’s score increased on one index but decreased on the other, the difference between the amounts of change determined the grouping. For example, if the country’s GRI score increased by 2.0 and its SHI score decreased by 1.5, the country went into the overall “0.1-0.9 increase” category. When a country’s score on one index stayed the same, the amount of change on the other index was used to assign the category. The methodology used by Pew Research Center to assess and compare restrictions on religion was developed by former Pew Research Center senior researcher and director of cross-national data Brian J. Grim in consultation with other members of the Pew Research Center staff, building on a methodology that Grim and Professor Roger Finke developed while at Penn State University’s Association of Religion Data Archives.36 The goal was to devise quantifiable, objective and transparent measures of the extent to which governments and societal groups impinge on the practice of religion. The findings were used to rate countries and self-governing territories on two indexes that are reproducible and can be periodically updated. 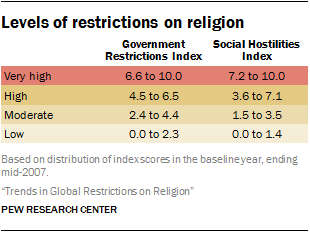 This research goes beyond previous efforts to assess restrictions on religion in several ways. First, Pew Research Center coded (categorized and counted) data from more than a dozen published cross-national sources, providing a high degree of confidence in the findings. The coders looked to the sources for only specific, well-documented facts, not opinions or commentary. Third, the Pew Research Center coding took into account whether the perpetrators of religion-related violence were government or private actors. The coding also identified how widespread and intensive the restrictions were in each country. Fourth, one of the most valuable contributions of the indexes and the questions used to construct them (see the section on “The Coding Instrument” on page 36) is their ability to chart change over time. The 198 countries and self-administering territories covered by the study contain more than 99.5% of the world’s population. They include 192 of the 193 member states of the United Nations as of 2014 plus six self-administering territories – Kosovo, Hong Kong, Macau, the Palestinian territories, Taiwan and Western Sahara.37 Reporting on these territories does not imply any position on what their international political status should be, only recognition that the de facto situations in these territories require separate analysis. As noted, this study includes four sources that were not included in the Pew Research Center’s first report on global restrictions on religion: Freedom House reports; Uppsala University’s Armed Conflict Database; the “Freedom of Religion or Belief” newsletters of Human Rights Without Frontiers; and the Global Terrorism Database. Since 2013, the Pew Research Center has used data from the Global Terrorism Database, maintained by the University of Maryland’s National Consortium for Terrorism and Responses to Terrorism (START), along with the International Crisis Group’s country reports, Uppsala University’s Armed Conflict Database and the State Department’s annual Country Reports on Terrorism, for information on religion-related terrorism. (One source used in earlier reports, the U.S. government’s Worldwide Incident Tracking System (WITS), is no longer available online.) Prior to 2013, the report relied only on the International Crisis Group reports, the Uppsala database and the State Department reports for information on religion-related terrorism. The Global Terrorism Database is one of the most comprehensive sources on terrorism around the world and is the source for the U.S. State Department’s Country Reports on Terrorism. The addition of this source thus provides greater context and information on terrorism without biasing the reporting through the addition of information that was not previously available. The questionnaire, or coding instrument, generated a set of numerical measures on restrictions in each country. It also made it possible to see how government restrictions intersect with broader social tensions and incidents of violence or intimidation by private actors. The coding instrument with the list of questions used for this report is shown in the Summary of Results in Appendix D.
The coding process required the coders to check all the sources for each country. Coders determined whether each source provided information critical to assigning a score; had supporting information but did not result in new facts; or had no available information on that particular country. Multiple sources of information were available for all countries and self-administering territories with populations greater than 1 million. Most of the countries and territories analyzed by Pew Research Center were multi-sourced; only small, predominantly island, countries had a single source, namely, the State Department reports. Coding the United States presented a special problem since it is not included in the State Department’s annual reports on International Religious Freedom. Accordingly, Pew Research Center coders also looked at reports from the U.S. Department of Justice and the FBI on violations of religious freedom in the United States, in addition to consulting all the primary sources, including reports by the United Nations, Human Rights Watch, Freedom House, the International Crisis Group and the U.K. Foreign & Commonwealth Office, many of which contain data on the United States. The Pew Research Center employed strict training and rigorous coding protocols to make its coding as objective and reproducible as possible. Coders worked directly under an experienced researcher’s supervision, with additional direction and support provided by other Pew Research Center researchers. The coders underwent an intensive training period that included a thorough overview of the research objectives, information sources and Methodology. After data collection for all countries was completed, Pew Research Center coders and researchers compared the scores from calendar year 2014 with those from the previous year, ending Dec. 31, 2013. They identified scores that had changed and analyzed the substantiating evidence for each year to make sure the change was substantive and not the result of coder error. Throughout this process, the coding instrument itself was continually monitored for possible defects. The questions were designed to be precise, comprehensive and objective so that, based on the same data and definitions, the coding could be reliably reproduced by others with the same results. At the same time, the Pew Research Center has attempted to minimize changes to the coding instrument as much as is possible to ensure all changes between years are the result of actual changes in restrictions and hostilities, not changes in methodology. The Pew Research Center coded 20 indicators of government restrictions on religion (see the Summary of Results). These 20 items were added together to create the GRI. In two cases, these items represent an aggregation of several closely related questions: Measures of five types of physical abuses are combined into a single variable (GRI Q.19), and seven questions measuring aspects of government favoritism are combined into an overall favoritism scale (GRI Q.20 is a summary variable showing whether a country received the maximum score on one or more of the seven questions). The GRI is a fine-grained measure created by adding the 20 items on a 0-to-10 metric, with zero indicating very low levels of government restrictions on religion and 10 indicating very high levels of restrictions. The 20 questions that form the GRI are coded in a standard scale from zero to one point, while gradations among the answers allowed for partial points to be given for lesser degrees of the particular government restriction being measured. The overall value of the index was calculated and proportionally adjusted – so that it had a maximum value of 10 and a possible range of zero to 10 – by dividing the sum of the variables by two. A test of whether the 20 items were statistically reliable as a single index produced a scale reliability coefficient of 0.9 for calendar year 2014. Since coefficients of 0.7 or higher are generally considered acceptable, it was statistically appropriate to combine these 20 items into a single index. The SHI was constructed by adding together the 13 indicators based on a 0-to-10 metric, with zero indicating very low impediments to religious beliefs and practices and 10 indicating very high impediments. The various questions that form the index are coded in a standard scale from zero to one point, while gradations among the answers allow for partial points to be given for lesser degrees of the particular hostilities being measured. The indicators were added together and set to have a possible range of zero to 10 by dividing the sum of the variables by 1.3. Beginning with data covering 2012, Pew Research Center stopped collecting data at the province-level; all data is coded at the country level. 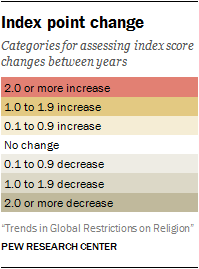 This is the fourth time Pew Research Center has analyzed restrictions on religion in a calendar year. Previous reports analyzed 12-month periods from July 1-June 30 (e.g., July 1, 2009-June 30, 2010). The shift to calendar years was made, in part, because most of the primary sources used in this study are based on calendar years. Starting with data covering 2013, researchers changed the way they coded government restrictions in Somalia. In previous years of the study, researchers had coded actions by the al-Shabaab rebel group as government restrictions, largely because the group effectively controlled large swathes of Somali territory. The extent of al-Shabaab control over Somali territory decreased in calendar year 2013, so researchers did not code their actions as government restrictions but rather as social hostilities. Researchers continued to follow this policy when coding data for 2014. This raises two important issues concerning potential information bias in the sources. The first is whether other countries that limit outsiders’ access and that may seek to obscure or distort their record on religious restrictions were adequately covered by the sources. Countries with relatively limited access have multiple primary sources of information that the Pew Research Center used for its coding. Each is also covered by other secondary quantitative data sets on religious restrictions that have used a similar coding scheme, including earlier years of coded State Department report data produced by Grim at Penn State’s Association of Religion Data Archives (ARDA) project (four data sets); independent coding by experts at the Hudson Institute’s Center for Religious Liberty using indexes also available from ARDA (one data set); and content analysis of country constitutions conducted by the Becket Fund for Religious Liberty (one data set). Pew Research Center staff used these for cross-validation. Thus, contrary to what one might expect, even most countries that limit access to information tend to receive fairly extensive coverage by groups that monitor religious restrictions. As in previous reports, this study provides a summary of the number of countries where specific religious groups faced government or social harassment. This is essentially a cross-tabulation of GRI.Q.11 (“Was there harassment or intimidation of religious groups by any level of government?”) and the first type of religious hatred or bias measured in SHI.Q.1.a. (“Did individuals face harassment or intimidation motivated by religious hatred or bias?”). For purposes of this study, the definition of harassment includes any mention in the primary sources of an offense against an individual or group based on religious identity. Such offenses may range from physical attacks and direct coercion to more subtle forms of discrimination. But prejudicial opinions or attitudes, in and of themselves, do not constitute harassment unless they are acted upon in a palpable way. The data collection period for the latest religious restrictions study had to be altered slightly. Normally, all sources used in the study are released by the time data coding begins in the summer. However, the U.S. State Department reports for 2014 (including the agency’s 2014 International Religious Freedom Report) were released much later than usual. As a result, data coding took place in three waves: summer 2015, fall 2015 and winter 2016. Pew Research Center staff compared the data collected in each wave with data collected in the other two waves, and with data collected for 2013, to make sure no systematic problems arose as a result of the extended data collection period, and to ensure consistency across all data collected.